This astounding documentary explores the compelling story of one woman on a mission to educate herself, and the world, on the connection between abortion and breast cancer. Trudging through the highly controversial subject of abortion, Punam Kumar Gill sought to weed out the biased research from the factual. With one goal in mind: to find the truth for the sake of women’s health, Gill was determined to interview medical organizations, corporations, and doctors to unravel personal politics to reveal these basic truths. Her research exposed breast cancer connections to abortion, premature birth, and psychological problems in relation to women’s long term health. Her digging publicized how 50 million women could be affected worldwide – that’s 1 in 3 American women right outside our front door. In an ironic twist, Gill is a self-professed advocate for a woman’s right to abortion but, as stated in the film, people must be pro-information in regards to female health. HUSH is perhaps the strongest documentary, regardless of where you stand on life issues, that provides information and insights that everyone would find valuable by shedding light on the harmful effects of abortion on a woman’s long term health. 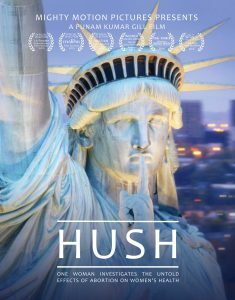 HUSH Documentary Trailer (2015) from Mighty Motion Pictures on Vimeo.